Velomacchi's Giro is a handy commuter bag that easily doubles as a long-range travel bag. A few months ago, the fine folks at Velomacchi sent me a brand spanking new Giro Backpack for testing purposes. Since it was the dead of winter in Detroit, and since my XS850 was in a million pieces, the bag didn't see a lot of action at first. It hung forlornly on my office door next to some jackets while I scoured the internet for 40-year-old Yamaha parts and dreamed of spring. Then it happened. My band kicked off a short tour, and since space on our tour bus is, shall we say, at a premium, I needed to pack light. My old, reliable touring duffel bag had seen its last trip and I didn't want to pack one of our larger pieces of luggage, so I figured I'd give the new bag a try. On first blush I was super impressed, which led to a couple months of traveling off-bike with the Giro. I flew with it, took the train with it, traveled in our old 90s-era school bus-based touring bus and finally, in early June of 2018, finally got to do some bike traveling with it. The verdict? It rules. For those of you who don't know, Velomacchi—a portmanteau of Velocità Macchina or "Velocity Machine—is a small, high-end gear company headquartered in Hood River, Oregon. 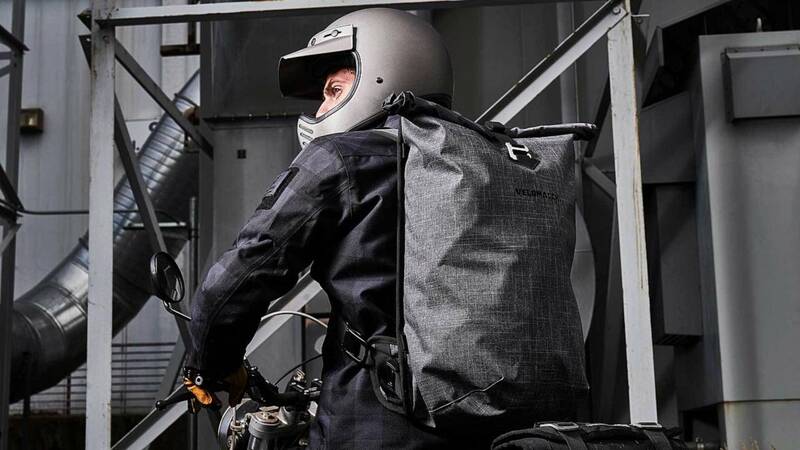 Founded in 2014 by former North Face Global Designer and inveterate gearhead Kevin Murray, the company makes bags and backpacks specially designed for use by motorcyclists. They also make a couple nice-looking pairs of riding gloves, but I haven't tried them out yet. Velomacchi gear is pretty high quality, and tends toward sleek, minimalist designs that use a ton of high-tech textiles, clever cam-style buckles, and freakin' magnets. Now that you've had a quick primer about the company, let's talk about the bag. The Giro Backpack 35L is a pretty simple design—large main compartment, a couple smaller pouches/pockets, straps, carrying handle, etc. The main compartment is can swallow 35 liters worth of gear—hence the 35L in the name—and measures 11"x21"x7". It's made from Acquaforte 3000 high-tensile nylon fabric which makes it watertight and abrasion resistant. The main compartment has a magnetic roll-top enclosure secured by an adjustable strap that fastens to the bag's face. The broad, comfortable, metal-jointed straps are mounted to a stiff ballistic quilted backplate that adds rigidity to the bag and helps protect the wearer. There's a space between the backplate and the main compartment designed to hold a hydration bladder (you know, like a Camelbak). The hydration bladder isn't included, so you'll have to provide your own. When you're not wearing the bag, you can stuff the straps behind the backplate and carry it via the handy top-mounted handle. The few times I flew with the Giro, this is how I configured the bag when I checked it to make sure the straps didn't get damaged. 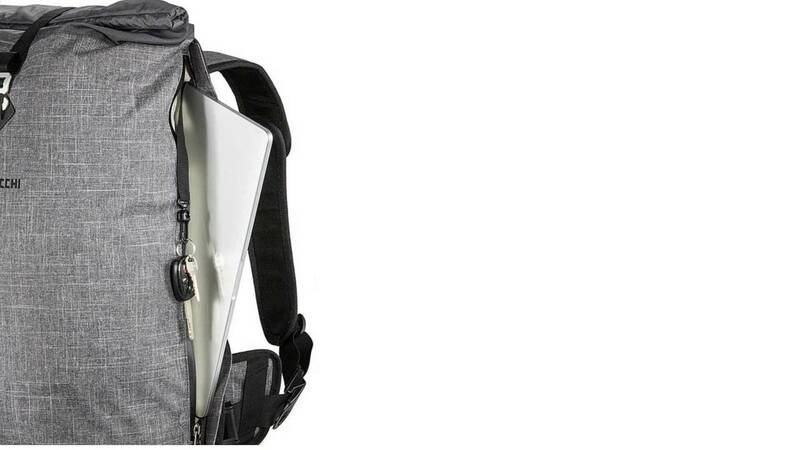 A closer look at the Giro 35L's laptop pocket. Inside the main compartment is a smaller pouch made from a thick, reinforced, rubbery material closed with a stout zipper. It's sewn to the bag and is great for carrying small things you need quick access to—pens, phone chargers, Altoids, sunglasses, a multi-tool, etc. It also features a stretchy nylon lanyard with a plastic clip for keeping track of your keys. This pouch is super handy, and makes living with the bag day-to-day much easier. The main pouch also features an emergency contact info tag, as well as information on the care and feeding of your slick new bag. In addition to the small internal pouch, there is a narrow external side pocket set between the main compartment and the backplate (lots of stuff goes back there, I think there's an extra-dimensional portal included to hold all of it). The side pouch closes with another sturdy zipper, is covered by a magnetically sealing flap, and is just the thing for carrying laptops or tablets. The side pouch easily swallowed my 10-inch Samsung tablet, case and all. The exterior of the bag boasts a handful of neat features that enhance the bag's wearability and versatility. There are tie-down loops for strapping it to your bike, rubberized stabilization pads that grip your waist and keep the bag centered on your body, pockets on the straps to hold pens/tire pressure guages and small first aid kits—all manner of cool stuff. This is what you're here for, right? Like, data is fine and all, but you guys want to know how the bag feels, how easy it is for you to wear. Let's get to it. I used my Giro 35L as my only bag during my recent trip to Milwaukee, and it performed exceedingly well. The cavernous main compartment easily swallowed three days worth of clothes, a tool kit, a couple pairs of gloves, and my dopp kit with ease. The smaller internal zipper pouch held my travel first aid kit, phone charger, a tin of Altoids, and some other bric-a-brac I like to travel with. I slid a pen into the pen/gauge holder on one strap, and my mini Leatherman into the small first aid pouch on the other. Everything I needed was right at hand, and with some smart packing I was able to find what I needed and live pretty easily with it all weekend without ever having to completely unpack it. The Giro 35L's low profile makes wearing a breeze. The bag performed fine during the first part of my trip, where I largely carried it by one strap or by the top handle, but it really shined when it was time to ride. Once I had the bag on and the straps adjusted, I could hardly tell it was there. The camlock strap adjusters are extremely slick and make adjusting the straps on the fly a breeze, even while wearing gloves. It sits firmly between your shoulder blades and its low profile barely affects your range of movement. I even wore it in the cramped confines of a WWII-era LST museum ship and had no problem navigating the extremely narrow ladderways. The outer nylon shell stood up well to scuffs and bumps while I tossed it around, and the internal watertight coating and magnetic seal kept my clothes and tools warm and dry when I got hit by rogue rain squalls. 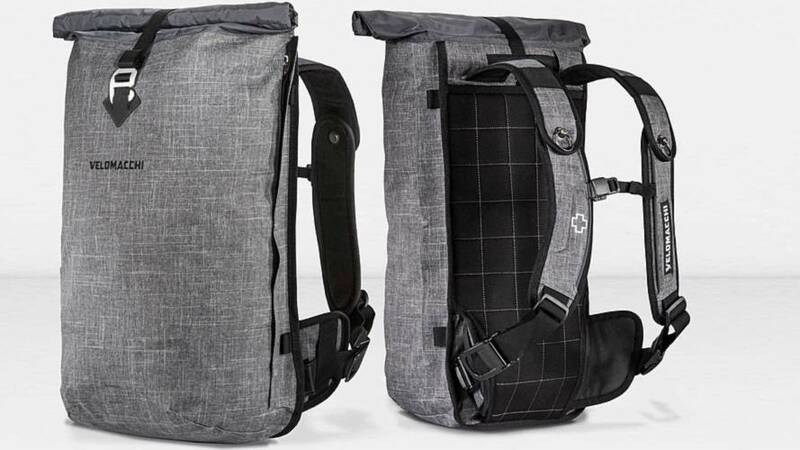 Overall the Giro Backpack 35L is sturdy, stylish, well-built, and both easy to use and wear. It holds a surprising amount of stuff, and is versatile enough to work as a short-range commuter bag and a long-range travel case. It lists for $179.00, and you can find out more about it—and the rest of Velomacchi's bags—at the company's website.